The quality of being orderly, consistent and intelligible (e.g. a coherent sentence). A constructive waveform produced by two or more waves that are phase- or frequency-locked. An ordered or constructive distribution of power content within a single waveform; autocoherence (e.g. sine wave). Many contemporary scientists believe it is the underlying state of our physiological processes that determines the quality and stability of the feelings and emotions we experience. The feelings we label as positive actually reflect body states that are coherent, meaning "the regulation of life processes becomes efficient, or even optimal, free-flowing and easy," and the feelings we label as "negative," such as anger, anxiety and frustration are examples of incoherent states. It is important to note, however, these associations are not merely metaphorical. For the brain and nervous system to function optimally, the neural activity, which encodes and distributes information, must be stable and function in a coordinated and balanced manner. The various centers within the brain also must be able to dynamically synchronize their activity in order for information to be smoothly processed and perceived. Thus, the concept of coherence is vitally important for understanding optimal function. The various concepts and measurements embraced under the term coherence have become central to fields as diverse as quantum physics, cosmology, physiology and brain and consciousness research. Coherence has several related definitions, all of which are applicable to the study of human physiology, social interactions and global affairs. The most common dictionary definition is the quality of being logically integrated, consistent and intelligible, as in a coherent statement. A related meaning is the logical, orderly and aesthetically consistent relationship among parts. Coherence always implies correlations, connectedness, consistency and efficient energy utilization. Thus, coherence refers to wholeness and global order, where the whole is greater than the sum of its individual parts. In physics, coherence also is used to describe the coupling and degree of synchronization between different oscillating systems. In some cases, when two or more oscillatory systems operate at the same basic frequency, they can become either phase- or frequency-locked, as occurs between the photons in a laser. This type of coherence is called cross-coherence and is the type of coherence that most scientists think of when they use the term. In physiology, cross-coherence occurs when two or more of the body’s oscillatory systems, such as respiration and heart rhythms, become entrained and operate at the same frequency. Another aspect of coherence relates to the dynamic rhythms produced by a single oscillatory system. The term autocoherence describes coherent activity within a single system. An ideal example is a system that exhibits sine-wavelike oscillations; the more stable the frequency, amplitude and shape, the higher the degree of coherence. When coherence is increased in a system that is coupled to other systems, it can pull the other systems into increased synchronization and more efficient function. 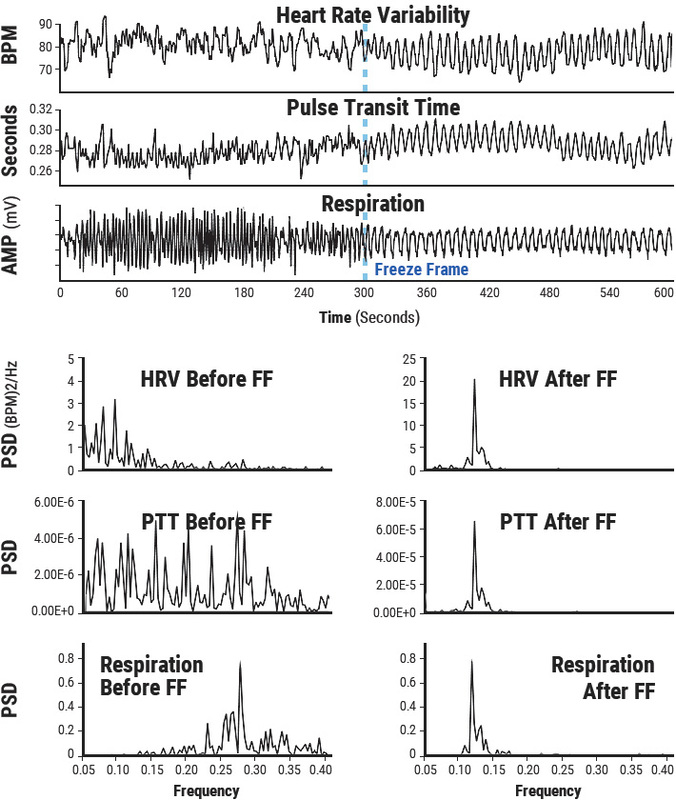 Figure 4.1 The top graphs show an individual’s heart rate variability, pulse transit time and respiration patterns for 10 minutes. At the 300-second mark, the individual did HeartMath’s Freeze Frame Technique and all three systems came into entrainment, meaning the patterns were harmonious instead of scattered and out of sync. The bottom graphs show the spectrum analysis view of the same data. The left-hand side is the spectral analysis before Freeze-Framing. Notice how each pattern looks quite different from the others. The graphs on the right show how all three systems are entrained at the same frequency after Freeze-Framing. For any system to produce a meaningful function, it must have the property of global coherence. In humans, this includes our physical, mental, emotional and social systems. However, the energy efficiency and degree of coordinated action of any given system can vary widely and does not necessarily result in a coherent output or flow of behavior. Global coherence does not mean everyone or all parts of a system are doing the same thing simultaneously. In complex globally coherent systems, such as human beings, there is a vast amount of activity at every level of magnification or scale that spans more than two-thirds of the 73 known octaves of the electromagnetic spectrum. It can appear at one level of scale that a given system is operating autonomously, yet it is perfectly coordinated within the whole. In living systems, there are microlevel systems, molecular machines, protons and electrons, organs and glands, each functioning autonomously, doing very different things at different rates, yet all working together in a complex harmoniously coordinated and synchronized manner. If this were not happening, it would be a free-for-all among the body’s independent systems, rather than a coordinated federation of interdependent systems and functions. Biologist Mae-Won Ho has suggested that coherence is the defining quality of living systems and accounts for their most characteristic properties, such as long-range order and coordination, rapid and efficient energy transfer and extreme sensitivity to specific signals. We introduced the term physiological coherence to describe the degree of order, harmony and stability in the various rhythmic activities within living systems over any given time period. This harmonious order signifies a coherent system, whose efficient or optimal function is directly related to the ease and flow in life processes. In contrast, an erratic, discordant pattern of activity denotes an incoherent system whose function reflects stress and inefficient utilization of energy in life processes. Specifically, heart coherence (also referred to as cardiac coherence or resonance) can be measured by HRV analysis wherein a person’s heartrhythm pattern becomes more ordered and sine wavelike at a frequency of around 0.1 hertz (10 seconds). When a person is in a more coherent state there is a shift in the relative autonomic balance toward increased parasympathetic activity (vagal tone), increased heart-brain synchronization and entrainment between diverse physiological systems. In this mode, the body’s systems function with a high degree of efficiency and harmony and natural regenerative processes are facilitated. Although physiological coherence is a natural human state that can occur spontaneously, sustained episodes generally are rare. While some rhythmic-breathing methods may induce coherence for brief periods, our research indicates that people can achieve extended periods of physiological coherence by actively self-generating positive emotions. When functioning in a coherent mode, the heart pulls other biological oscillators into synchronization with its rhythms, thus leading to entrainment of these systems (Figure 4.1). Entrainment is an example of a physiological state in which there is increased coherence between multiple oscillating systems and also within each system. Thus, our findings essentially underscore what people have intuitively known for some time: Positive emotions not only "feel better," they actually tend to increase synchronization of the body’s systems, thereby enhancing energy and enabling us to function with greater efficiency and effectiveness. The coherence model takes a dynamic systems approach that focuses on increasing people’s self-regulatory capacity through self-management techniques that induce a physiological shift, which is reflected in the heart’s rhythms. We also suggest that rhythmic activity in living systems reflects the regulation of interconnected biological, social and environmental networks and that important biologically relevant information is encoded in the dynamic patterns of physiological activity. For example, information is encoded in the time interval between action potentials in the nervous system and patterns in the pulsatile release of hormones. Our research also suggests that the time intervals between heartbeats (HRV) also encode information, which is communicated across multiple systems and helps synchronize the system as whole. The afferent pathways from the heart and blood vessels are given more relevance in this model because of the significant degree of afferent cardiovascular input to the brain and the consistent generation of dynamic patterns generated by the heart. Our perspective is that positive emotions in general, including self-induced positive emotions, shift the entire system into a more globally coherent and harmonious physiological mode, one that is associated with improved system performance, ability to self-regulate and overall wellbeing. 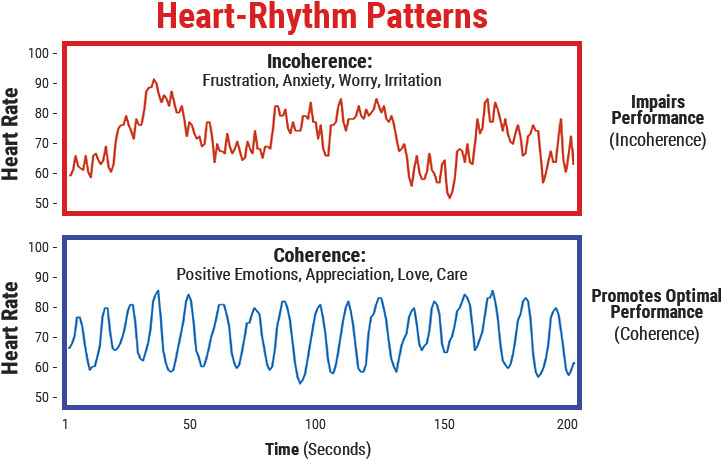 The coherence model predicts that different emotions are reflected in state-specific patterns in the heart’s rhythms independent of the amount of HRV/HR (Figure 4.2). Recent independent work has verified this by demonstrating a 75% accuracy rate in detection of discrete emotional states from the HRV signal using a neural network approach for pattern recognition. In a study of the effects of playing violent and nonviolent video games, it was found that when playing violent video games, the players had lower cardiac coherence levels and higher aggression levels than did nonviolent game players and that higher levels of coherence were negatively related to aggression. Several studies in healthy subjects, which helped inform the model, show that during the experience of positive emotions, a sine-wavelike pattern naturally emerges in the heart’s rhythms without any conscious changes in breathing. [51, 133] This is likely because of more organized outputs of the subcortical structures involved in processing emotional information, as described by Pribram, Porges, Oppenheimer and Hopkins and Thayer, in which the subcortical structures influence the oscillatory output of the cardiorespiratory control system in the medulla oblongata. The functional status of the underlying psychophysiological system determines the range of one’s ability to adapt to challenges, self-regulate and engage in harmonious social relationships. Healthy physiological variability, feedback systems and inhibition are key elements of the complex system for maintaining stability and capacity to appropriately respond to and adapt to changing environments and social demands. The oscillatory activity in the heart’s rhythms reflects the status of a network of flexible relationships among dynamic interconnected neural structures in the central and autonomic nervous systems. State-specific emotions are reflected in the patterns of the heart’s rhythms independent of changes in the amount of heart rate variability. Subcortical structures constantly compare information from internal and external sensory systems via a match/mismatch process that evaluates current inputs against past experience to appraise the environment for risk or comfort and safety. Physiological or cardiac coherence is reflected in a more ordered sine-wavelike heart-rhythm pattern associated with increased vagally mediated HRV, entrainment between respiration, blood pressure and heart rhythms and increased synchronization between various rhythms in the EEG and cardiac cycle. Vagally mediated efferent HRV provides an index of the cognitive and emotional resources needed for efficient functioning in challenging environments in which delayed responding and behavioral inhibition are critical. Information is encoded in the time between intervals (action potentials, pulsatile release of hormones, etc.). The information contained in the interbeat intervals in the heart’s activity is communicated across multiple systems and helps synchronize the system as a whole. Patterns in the activity of cardiovascular afferent neuronal traffic can significantly influence cognitive performance, emotional experience and selfregulatory capacity via inputs to the thalamus, amygdala and other subcortical structures. Increased "rate of change" in cardiac sensory neurons (transducing BP, rhythm, etc.) during coherent states increases vagal afferent neuronal traffic, which inhibits thalamic pain pathways at the level of the spinal cord. Self-induced positive emotions can shift psychophysiological systems into more globally coherent and harmonious orders that are associated with improved performance and overall well-being. The coherence model includes specific approaches for quantifying the various types of physiological coherence measures, such as cross-coherence (frequency entrainment between respiration, BP and heart rhythms), or synchronization among systems (e.g., synchronization between various EEG rhythms and the cardiac cycle), autocoherence (stability of a single waveform such as respiration or HRV patterns) and system resonance. A coherent heart rhythm is defined as a relatively harmonic, sine-wavelike signal with a very narrow, high-amplitude peak in the lowfrequency (LF) region of the HRV power spectrum with no major peaks in the very-low-frequency (VLF) or high-frequency (HF) regions. Physiological coherence is assessed by identifying the maximum peak in the 0.04 to 0.26 hertz range of the HRV power spectrum, calculating the integral in a window 0.030 hertzwide, centered on the highest peak in that region and then calculating the total power of the entire spectrum. The coherence ratio is formulated as (peak power/[total power – peak power]). High heart-rhythm coherence (sine-wavelike rhythmic pattern). Increased entrainment and synchronization between physiological systems. Efficient and harmonious functioning of the cardiovascular, nervous, hormonal and immune systems. Social coherence relates to pairs, family units, groups or larger organizations in which a network of relationships exists among individuals who share common interests and objectives. Social coherence is reflected as a stable, harmonious alignment of relationships that allow for the efficient flow and utilization of energy and communication required for optimal collective cohesion and action. There are, of course, cycles and variations in the quality of family, team or group coherence, similar to variations in an individual’s coherence level. Coherence requires that group members are attuned and emotionally aligned and that the group’s energy is globally organized and regulated by the group as a whole. Group coherence involves the same principles of global coherence described earlier, but in this context it refers to the synchronized and harmonious order in the relationships between and among the individuals rather than the systems within the body. The principles, however, remain the same: In a coherent team, there is freedom for the individual members to do their part and thrive while maintaining cohesion and resonance within the group’s intent and goals. Anyone who has watched a championship sports team or experienced an exceptional concert knows that something special can happen in groups that transcends their normal performance. It seems as though the players are in sync and communicating on an unseen energetic level. A growing body of evidence suggests that an energetic field is formed between individuals in groups through which communication among all the group members occurs simultaneously. In other words, there is a literal group "field" that connects all the members. Sociologist Raymond Bradley, in collaboration with eminent brain researcher, neurosurgeon and neuroscientist Dr. Karl Pribram, developed a general theory of social communication to explain the patterns of social organization common to most groups and independent of size, culture, degree of formal organization, length of existence or member characteristics. They found that most groups have a global organization and coherent network of emotional energetic relations interconnecting virtually all members into a single multilevel hierarchy.